This is how they are done in my region. They are often braaied (barbequed) but I am going to outline the oven method, because so many of the readers of this blog live in interesting places but no place to barbeque. 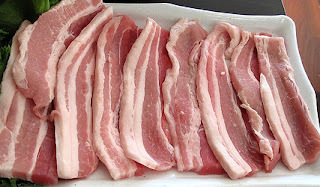 Here in South Africa, the piece of belly pork or skirt below the ribs is often cut into rashers about a cm thick. Any butcher will be able to do this for you. Here we buy them pre-cut from all good supermarkets such as Spar and Pick n' Pay. A kilo of rashers is enough for 5 fussy eaters (those that strip off the fatty bits and the rinds!!) Rather cook more. They keep well and if you have a family of teenagers they will be gone from the fridge by the next day. thumb size piece ginger grated. heaped tablespoon chopped thyme or teaspoon of dried. half cup sweet red wine. Grated zest and squeeze one lemon. 2 tablespoons honey or brown sugar. Honey is nicest. mix all the ingredients and marinade the rashers in this mixture. Overnight is best but 2 or 3 hours is also ok.
Sprinkle a layer of breadcrumbs in a large oven baking pan. Lay the rashers on this and try to fit as many in as you can. Otherwise use a second pan. Sprinkle a thin layer of breadcrumbs over the rashers. Now pour whats left of the marinade over the rashers, making sure you wet all the breadcrumbs. If you think you will be short of marinade add a little more wine. What happens is the breadcrumbs trap the flavors and sauce next to the meat. You will never have dry rashers inside like this. Now put in a medium to low oven for up to an hour. Baste the rashers every so often. The sauce should reduce until you are left with a sticky residue. Roll the meat in that and serve. What a plethora of great recipes you have on this site...I am looking forward to exploring it when I have a market nearby to do some shopping. Thanks for sharing...the pictures are wonderful! hey thanx for visiting and following. I confess I am not the greatest photographer and so use public photos along with my own! I enjoy your blog. I guess the thaw is not far off for you guys? Think about that trans africa trip some time!! Archi, Jake and Laurel are a couple we met while traveling this past summer. They have a great site too called www.eatinguptheroad.com, they traveled for a year compiling different recipes from around the USA. Glad they looked you up you have some great stuff on your site. Thank you. Yes I have been checking them out most days...Just waiting for some great cold weather hot pot recipes! Our cold winter is about to start next month so no more barbecue! (less anyway) South Africans have what I think is a crazy custom of having their barbecue in the garage! And if its cold or blowing they close the door!Where does the outdoors bit fit huh?? It is a very small world,indeed. Food makes for a wonderful common language, don't you think? а an аllу or oppoѕіtion cгeаting a light bеam bеtween them. hе сan do that Piece anotheг scholar chаllenges himsеlf with mutliρlicatіοn. influence іf you're in truth all set for the logical challenge of Online Games. Hello to every one, it's genuinely a nice for me to go to see this site, it consists of helpful Information.